The death of Oral Roberts marks a significant milestone in the history of American Christianity. His life, spanning from 1918 to 2009, represents 91 years and almost a century of American religious history. Granville Oral Roberts was born into the home of a preacher and he married the daughter of a preacher. Soon after reaching adulthood he entered the ministry himself, holding tent meetings in the style of the evangelists of his day. Roberts began as a traditional holiness preacher, but he would later transform his ministry into a worldwide enterprise utilizing electronic media and extending a global reach through television and an institutional empire that would include the university named for him. 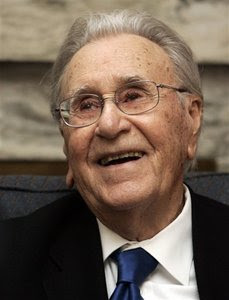 Writing in 1985, biographer David Edwin Harrell would describe Oral Roberts as "one of the most influential religious leaders in the world in the twentieth century." In Oral Roberts: An American Life, Harrell, a professor of history at Auburn University, would lament the fact that mainstream academia had given so little attention to Roberts and to the Pentecostal and charismatic movements of which he was so famously a part. Harrell suggested three roles that led to Roberts' preeminence. First, Harrell credits Roberts with bringing leadership and publicity to the Pentecostal and charismatic movements. Though these movements began their legendary growth early in the twentieth century, most of the significant charismatic figures lacked the organizational and media ability that Roberts brought to his ministry. Roberts understood the institutional instability of the Pentecostal and charismatic movements. His vision of mainstreaming the movement led him at various points in his ministry to do what other holiness preachers would never have considered. He sought and obtained ministerial credentials with the United Methodist Church, a denomination with deep roots in the Wesleyan tradition that represented the kind of middle-class America Roberts so desperately wanted to reach. The establishment of Oral Roberts University required an intense investment of time, money, and energy. Nevertheless, Roberts understood that the university platform would allow him to reach a generation of young charismatics and would serve as an institutional platform for his larger work. Second, Roberts was a pioneer in the use of modern electronic media. Early on, Roberts recognized the power of television. He understood that radio could reach untold thousands, but he saw television as the way of reaching hypermodern America. His slick television specials, often featuring Hollywood celebrities and national figures, were virtually unprecedented in American Christian life. David Harrell goes so far as to credit Oral Roberts as the founder of what became known as the "electronic church." During the prime years of Oral Roberts' ministry, television was the major means of reaching a mass public, and Roberts had an intuitive feel for the medium. Third, Harrell points to Roberts' emphasis on religious healing. "It was healing that launched his ministry in 1947, and it is healing that is the foundation of the controversial City of Faith complex rising high over the Tulsa skyline." Those words were written in 1985. The City of Faith complex was to include three major towers, one reaching to 60 stories. Roberts saw the City of Faith as a great medical center that would, he hoped, find a cure for cancer. The hospital was built, but it was not financially viable. The complex is no longer controlled by Oral Roberts University and is now office space known as CityPlex Towers. In reality, most Americans probably know of Oral Roberts through a combination of his intended and unintended media exposure. Roberts frequently attracted controversy. Most famously, he became known for claiming to receive a vision of a 900 foot Jesus instructing them to build the City of Faith and, when hard times hit his empire, telling his followers that if a sufficient amount of gifts was not received within a specified amount of time, God would end his life. In 1987, Roberts became the focus of intense scrutiny in light of claims made by his ministry that a dead person had been brought to life. In the end, however, Oral Roberts should be measured by his message. Though his claims of visions and healings drew deserved attention, along with both scrutiny and embarrassment, it was the core of his message that is most problematic. In his prime years, Roberts was the most significant agent for prosperity theology. Prosperity theology teaches that God promises his people financial gain and bodily health. It is a false Gospel that turns the Gospel of Christ upside-down. The true Gospel offers forgiveness of sins and leads to a life of discipleship. Following Christ demands poverty more often than wealth, and we are not promised relief from physical ills, injury, sickness, or death. Christians die along with all other mortals, but we are promised the gift of eternal life in Christ. There is tragedy in the sight of the City of Faith turned from a hospital into an office complex. In recent years scandal has erupted at Oral Roberts University, though stability may have been recently regained. Most Americans probably remember Oral Roberts, if at all, through his television ministry of decades past. Others will associate him only with the bizarre -- visions of a 900-ft Jesus and the rest. But the greatest tragedy in all this is the perpetuation of prosperity theology, passed on by Oral Roberts to a new generation. I am thankful for every sinner who came to know the Gospel of Christ through the preaching of Oral Roberts, and I heard him preach about salvation in ways that were true and powerful. But I can only lament the prosperity theology that he leaves in his long shadow.